Remember Dynamints back in the late 1970s? They were sorta like Tic Tacs, but were slightly larger in size and packaged in a horizontal-shaped plastic box. 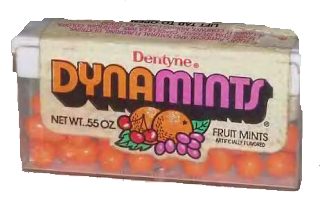 Dynamints were available in minty flavors, but my personal favorite were the sweet, fruity flavors such as orange and grape. I remember the red flavor having a hot kick to 'em. Ahhhh ... like the Burger Bubble hamburger gum, Dynamite is just another old school treat I wish I could taste just one more time. I love how you bring back products and commercials or shows that I'd long forgotten. Thanks, Ally. I loved Dynamints - not sure why, maybe because of the hokey, catchy commercial. I totally remember these - they were cool because they were different than Tic Tacs! Those were pretty awesome commercials!